This is a Guest Post by Scott Boyd. 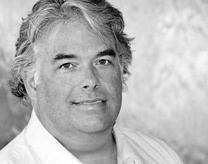 As a content writer specializing in the financial sector, Scott Boyd has produced educational materials and conducted market analysis for several of Canada’s leading financial institutions. Scott now contributes articles to the OANDA blog and is keenly interested in the factors affecting global currency prices. Japan faces major economic challenges – dealing with them is made more difficult, and more pressing, by the country’s unique demographics. The combination of staggering levels of total debt and a very high debt-to-GDP ratio with the country’s low birth rate and rapidly aging population point to a difficult future for the country. Scott takes a close look at the challenges confronting Japan. Japan recently surpassed a dubious milestone when the country’s total debt officially topped the one quadrillion yen ($14 trillion) mark. Expressed as a percentage of the country’s Gross Domestic Product, Japan’s total debt exceeds 225 percent of the country’s GDP, and with the exception of only Italy, Japan’s debt-to-GDP ratio is now more than twice that of any other G7 country. Despite having one of the world’s highest debt ratios, Japan’s debt remains in demand even though yields on Japanese bonds are at their lowest in nearly two years. The yen too continues to appreciate in spite of efforts by the Bank of Japan to weaken the currency. Considering how yields have ballooned for the more indebted of the Eurozone countries, it may appear that Japan is not being held to the same standard by the investing community. Greece was forced to work out a deal with its creditors to avoid a default and bond yields for several countries, including Spain, have risen sharply and are nearing levels many consider to be unsustainable. Meanwhile, Japan has no trouble finding buyers for 2-year bonds offering a measly 0.11 percent; given all that we have witnessed in Europe, it seems counter-intuitive that Japan’s bond sales and currency should remain so robust. However, there is a fundamental difference between Japan and Europe; in Japan, the vast majority of the debt is actually held by, and continues to be snapped up by, Japanese institutions and the people of Japan themselves. 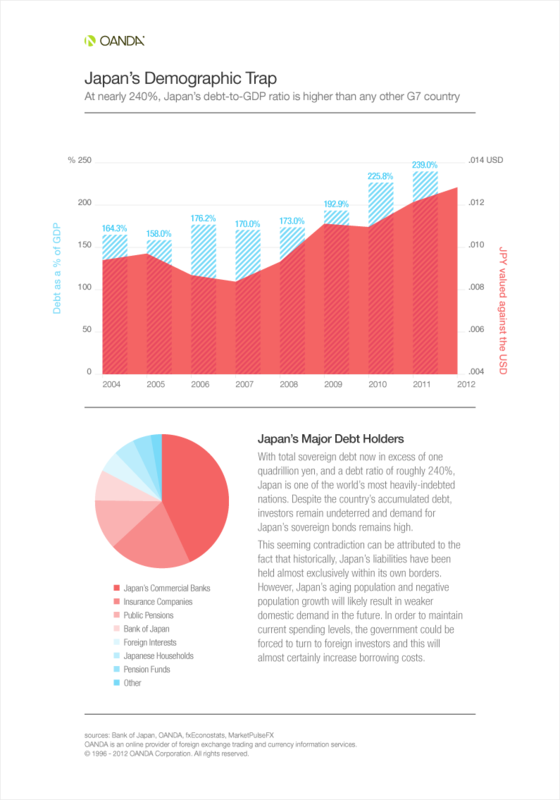 Very little – relatively speaking – of Japan’s debt is held by foreign interests. Unfortunately, while keeping most of the country’s debt within its own borders may avoid issues similar to those facing the Eurozone, this arrangement is not without concern. Japan is coping with negative population growth and this means that as Japan’s soon-to-be retiring workers leave the workplace, the number of younger workers to replace the retirees are too few in number to support current growth levels. This alarming situation puts the long-term sustainability of the economy at peril. As we shall discuss later on, the demographics that have for so long worked to Japan’s advantage, will soon align against the country’s best interests. 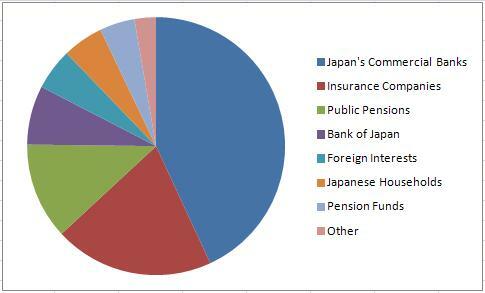 A 2009 breakdown of Japan’s debt placed foreign ownership at just slightly over 5 percent. Clearly, Japan’s reputation as a nation of savers is well-earned. However, in this case, the diligence exercised by the people of Japan to build their savings has had unintended consequences on the yen. Because the lion’s share of Japan’s debt is held by the people of Japan, and because they continue to eagerly purchase new bond issues, the yen is considered well-supported. This, together with Japan’s historically strong export sales has contributed to the yen’s track record of consistent exchange rate gains. It is this track record that has led to the yen being considered a “safe haven” destination. Adding to the yen’s appeal as a safe haven currency is the expectation that Japan’s inflation rate will remain stable for the near-term at least. This reduces the likelihood of future buying power being eroded by an unexpected rise in inflation and these are the factors investors look for when seeking to shelter assets during times of market turmoil. While there may be better choices for speculative exchange rate gains, there are few other currencies offering the degree of stability the yen represents, and with the growing uncertainty in Europe, the amount of money “parked” in the yen is likely to rise. While the yen bulls and those seeking shelter from market volatility may welcome the yen’s persistent appreciation, the Bank of Japan does not share the same enthusiasm. The modern form of Japan’s economy was built largely on exports taking advantage of a cheap labor force and low manufacturing costs as the country entered a rebuilding phase following the end of the war in 1945. Nearly seventy years later, Japan’s export industry remains a key part of its economy but with global consumer demand still well below pre-recession levels, Japan has suffered a decline in sales as importing economies struggle to find their feet. Even internal factors including last year’s earthquake and a general slowdown in productivity have conspired to send Japan’s balance of trade into a rare deficit situation. Of course, it is not only a stronger yen that has hurt Japan’s export sales. Japan is also forced to import its oil and rising energy costs have further eroded Japan’s ability to compete. Japan’s well-documented problems with its nuclear energy program will force Japan to continue its reliance on costly forcing energy to power its industries. For a country that counts so heavily on exports, this is a dangerous turn of events and authorities have come under increasing pressure to ease the yen’s rate of appreciation to make Japan’s exports more competitive. When Central Banks determine that weakening the currency would be advantageous for the economy, the first course of action tends to be a reduction in interest rates. The resulting lower yield on deposits simultaneously reduces demand for the currency which can – potentially – lead to a decrease in the exchange rate for the currency. For exporting nations, a weaker currency can boost export sales as the reduced exchange rate helps make exports more affordable for foreign buyers. Previous attempts by the Central Bank to slow the yen’s ascent has already resulted in slashing interest rates to just 0.05 percent. With rates practically at zero already, there is no further benefit available from an interest rate adjustment and the Bank can dispense with any hope that other Central Banks will act to strengthen their respective currencies. The European Central Bank is facing the prospect of a possible recession in several Eurozone countries and this essentially nullifies the likelihood of an interest rate hike at this time. 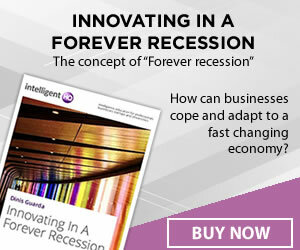 Likewise, the U.S. economy is recovering at a painfully slow rate and the Federal Reserve has taken every opportunity of late to reconfirm its pledge to hold interest rates at 0.25 percent at least until the middle of 2014. This leaves the authorities in Japan no alternative but to resort to direct market intervention to ease monetary policy. Resigned to the fact that market intervention is the only viable option still available for weakening the yen, Japan initiated a series of actions last year to release trillions of yen into the economy. The Bank has continued these efforts into the new year and since the beginning of 2012, authorities have made an additional 20 trillion yen available to the banking system. This includes a 10 trillion yen infusion in February, followed by an additional 10 trillion yen in April. However, since then, the dollar has continued to fall and as of the first week of May, has retraced to about 80 yen to the dollar. This has increased pressure on Japanese currency officials to take more decisive action to protect exports as the yen once again closes in on 82 yen to the dollar. Last year, Chief Cabinet Secretary Yoshito Sengoku referred to this level as the “line of defense to prevent currency strength from harming the economy”. Given that statement, and seeing that, presently, one U.S. dollar has fallen back to about 80 yen, most expect further intervention is inevitable. While officials grapple with what seems to be a currency that simply does not react to the laws of economics, there is one law that even the yen will be powerless to resist – the law of nature. Japan’s population as a whole is growing older and the demographics point to a future where retirees outnumber workers, and to a time when the country’s famous savings will be whittled down to next to nothing. Japan’s aging populace is the result of declining birth rates and exceptionally low immigration. According to a 2009 United Nations report, Japan was the oldest society on the planet with a median age of 44 years. The outlook is expected to worsen as the country’s death rate now exceeds the birth rate indicating the average age will only continue to rise. Naturally, as more of Japan’s citizens reach their retirement years, they will start to withdraw money from their savings thereby reducing the pool of savings, eventually resulting in a near-total drawdown on these funds. The county’s growing legion of retirees will also have little need to add to their savings and this could prove the event that forces Japan to turn to outside investors to bridge the growing deficit. Unlike most of those now buying Japan’s debt, these new investors will not be purchasing Japan’s bonds for patriotic reasons – they will be looking for speculative gains, and in order to attract new investors, yields will unquestionably be forced higher. Considerably higher, in fact, and given the current debt-to-GDP ratio, and a structural annual budget deficit expected to top 15 trillion yen by 2015, investors may feel the new Japan represents too great a risk. With Japan’s population aging at an accelerated pace, and with the coming generations insufficient in number to fill the thinning ranks, the long-term sustainability of the economy is at risk. This is the demographic trap that is poised to spring shut.